Experience in the Far East in combat in 1934 and 1935 with the Japan ese Army (read also The Red Army) of Manchuria had shown the vulnerability of riveted tank construction, and so the decision was taken to produce a tank with welded armour. It was in this remote theatre that at Khalkin Gol in 1939 the unknown general Georgi Zhukov demonstrated his brilliance as a tank commander. His skillful handling of five armoured brigades expelled the japanese Sixth, or Kamo, Army from positions they had captured on the Mongolian Manchurian border by the Khalkin River. The Japanese commander who had disobeyed orders and invaded Soviet territory had air superiority, and had assembled 3 infantry divisions, 180 tanks, 500 guns and 450 aircraft. 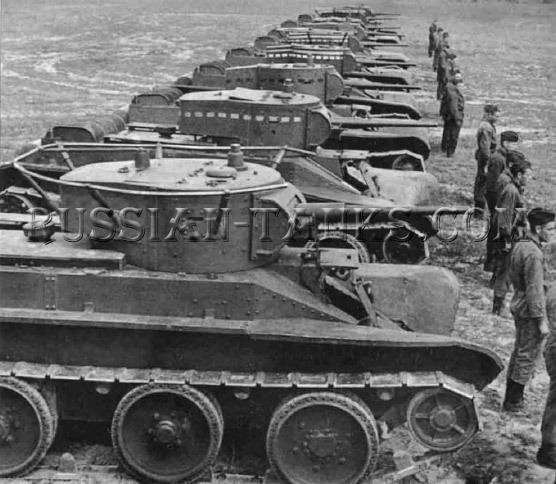 The Russians had 100,000 infantry with 498 tanks, strong artillery and 580 outclassed aircraft. Zhukov lIsed his infantry to hold the japanese from and then launched his armour in a pincer attack. The Soviet losses were about 10,000, but the shaken Japanese withdrew after suffering losses of about 18,000. The new tank that grew out of this battlefield experience became the BT-7, the next improvement to the BT family. It had a conical turret, thicker armour, more fuel and ammunition capacity, a ball-mounted machine gun in the turret rear, and stronger transmission. The Model 35 45mm (1,77in) gun on the BT-7 had 146 rounds, a marked improvement on the BT-5 that had carried a maximum of 115 rounds. The later production types BT-7-2 (read also Medium tank BT-1, BT-2, BT-5) were fitted with twin horn periscopes. The BT-7 was powered by the new M 17-TV-12 petrol engine that developed 372kW (500bhp) at 1760rpm. It was a copy of a German BMW engine that had originally been designed for aircraft use, and gave a road speed of 72km/h (45mph), a cross-country speed of 50km/h (31mph), and a road range of 430km (265 miles). The weight had risen to 13,900kg (13,68 tons), and the hull was now 5,66m (18ft 7in), the width 2,29m (7ft 6in) and height 2,42m (7ft 11in). 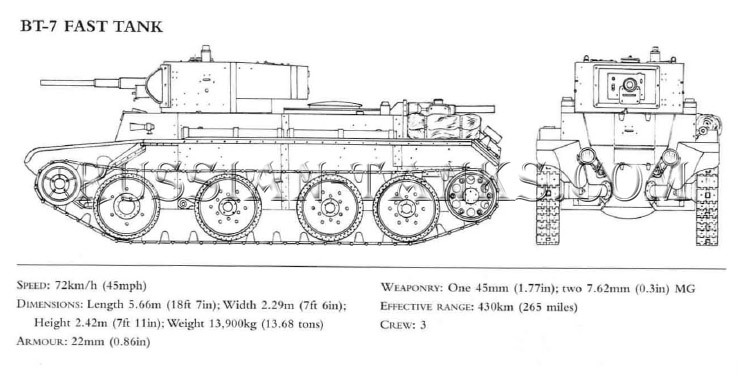 Maximum hull armour was increased to 22mm (0,86in), but minimum remained 6mm (0,24in). In 1939 it was the major Soviet fighting tank. Variants included the BT-7A, a close support vehicle mounting the 76,2mm (3in) regimental howitzer in a larger turret with 50 rounds and two DT machine guns. It was intended to support cavalry tank formations , and carried 50 rounds of main ammunition and was slightly heavier than the BT-7. The OP-7 was a flamethrower version that had the fuel cell for the projector in an armoured pannier on the right hull side. The BT-7(V) or BT 7TU was the commander's model with the turret of the BT-5(V) with radio and frame antenna, though later models had a whip antenna chat made them less of an obvious target in tank-on-tank actions. The BT-7 saw action in Finland and a 150 during the Soviet (read also Soviet tank) invasion of eaStern Poland in 1939. Its nemesis would come in 1941 with Operation Barbarossa, the German invasion of the USSR. Captured tanks were employed by German forces. painted field grey and boldly marked with black crosses all all vertical surfaces as well as hatches. As with the practice of using captured T-34s, rhe necessity to mark them clearly to avoid ' friendly fire' would often nullify any arrempts made to camouflage the tanks. Though only about 700 of these tanks were built between 1939 and 1940, they represent a transition vehicle that had many of the characteristics of the early T-34.The BT-7M weighed 14,650kg (14,4 tons), was 6,11m (20ft) long and 2,46m (8ft) high and was powered by a V-12 liquid-cooled diesel engine based on a Hispano-Suiza 12Y aircraft engine that gave a top road speed of 86km/h (53,4mph) and cross-country of 50km/h (31mph). Diesel conferred a number of advantages: it increased the radius of action by approximately one-third over the petrol engine for the same amount of fuel: it reduced the fire risk; and it simplified maintenance and production, as well as simplifying logistics. The BT-7M had a full-length sloping glacis instead of the pointed; 'prow' of the earlier BT designs, though the armour protection was the same as the BT-7. It reverted to wheel-and-tracks, a system that Mikhail Koshkin of the Kharkov bureau saw as an added weight for no operational benefit and which he fought to exclude from the T-34. The BT-8 had a 45mm (1,77in) Model 38 gun with 146 rounds, and two DT machine guns with 2394 rounds. It was with the BT-7s and BT-8s that Zhukov went on to achieve his victory at Khalkin Gol. Developed in 1939, this single experi mental tank was the last of the BT series and was in effect the BT-7M hull improved by sloping the side armour in the same way as the glacis plate. 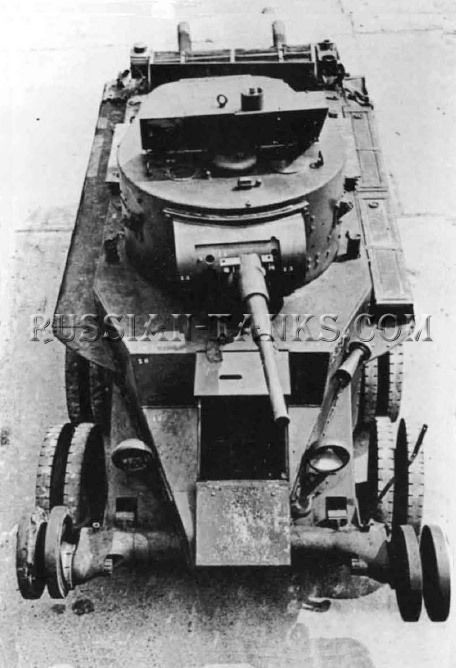 Though the tank had a BT-7 turret with 45mm (1,77in) gun. this was probably for trial, purposes only. It had a crew of three and maximum armour protection of 30mm (1,18in). Its shape was a precursor of the T-34. The tank weighed 15,600kg (15,35 tons) and was 5,76m (18ft 11in) long, and 2,28m (7ft 6in) high and wide. The M17-T-V-12 diesel produced 372kW (500bhp) and gave a top road speed of 65km/h (40mph) and a road range of 400km (250 miles). The BT provided many of the components for the prototype PT-1 (Plavayushchiy Tank-1, or Amphibious Tank-1). Developed by a team which was headed by N. Astrov and N. Tsiets in 1932, it had a larger hull. This wider hull was designed to give sufficient buoyancy in order to ensure that it would float. It was propelled through the water by means of a propeller fitted beneath the hull and it had a rudder for underwater steering. During two years of trials, a new version, designated the PT-1A, was proposed. It was designed with various modifications, including a shorter pitched track. Even though it was not accepted by STAVKA for mass production, due to its design complexity, a small production run was authorized by the Directorate of Mechanization and Motorization and RVS, in order thar tactical trials could be made with amphibious vehicles.